Once you have decided to study in VFU "Chernorizets Hrabar" you should know more about the beautiful city of Varna. And we are here to help you with that. Varna is the third largest city in Bulgaria and the largest one on the Black Sea shore with population of about 335 177 people. Situated strategically in the Gulf of Varna, the city has been a major economic, social and cultural centre for almost three millennia. Varna, historically known as Odessos (Ancient Greek: Ὀδησσός), grew from a Thracian seaside settlement to a major seaport on the Black Sea. Varna is an important centre for business, transportation, education, tourism, entertainment and healthcare. The city is referred to as the maritime capital of Bulgaria and headquarters the Bulgarian Navy and merchant marine. 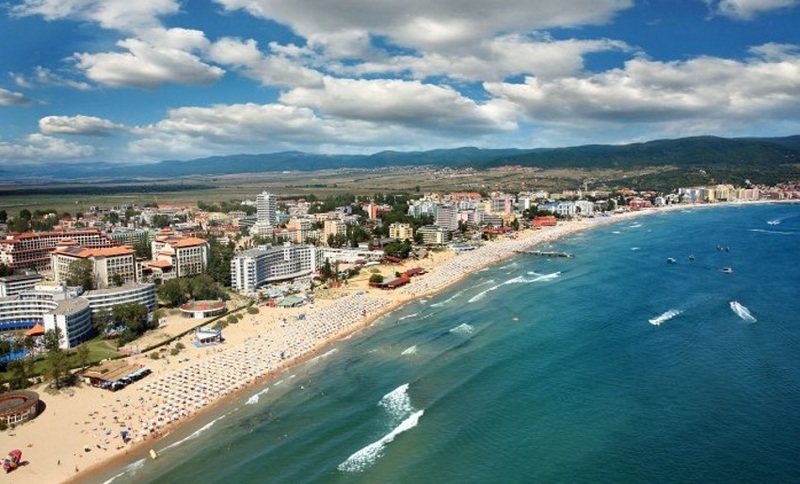 In 2008, Varna was designated seat of the Black Sea Euroregion by the Council of Europe. “Golden Dolphin”, International Photographic Saloon, Bulgarian Film Festival “Golden Rose”, etc. - The town was established as a trading colony in 570 B.C. under the name of Odessos (town on water) by Greek sea-faring colonizers from the town of Milet in Asia Minor at the site of an earlier Thracian settlement. - In 15 year A.D. province of Moesia was annexed in the Roman Empire and Odessos was finally overcome. - 2nd and 3rd century– the town’s best year. The Romans fortified the city, built a water-supply system, many temples and public buildings – the Thermal Baths. - After the disintegration of Roman Empire in 395 A.D., the town became an important port of the Eastern Roman Empire (Byzantium) and was converted to Christianity. - The town was destroyed several times: by the Huns (in the 5th A.D.), by the Avars and Slavs (in 6th A.D). - The Slavs gave the present name of the town – Varna. It was first mentioned when the proto-Bulgarian horseman of Khan Asparuh found the First Bulgarian Kingdom in 681. - During the 13th and 14th century Varna had turned into a thriving commercial port city frequented by Genoese and later also by Venetian and Ragusan merchant ships. -I n 1393 Varna was captured from the Ottoman troops. - 10 November 1444 - Battle of Varna – a crusade for the liberation of the Christians on the Balkan Peninsula led by Ladislaus III Jagello and his Hungarian general Janos Hunyadi (20 000 crusaders) was conquered by the strong army of Sultan Murad II (60 000 soldiers). - The Russians temporarily took over the city in 1773 and again in 1828, returning it to the Ottomans in 1830. - 1866 – the first railroad in Bulgarian lands connected Varna with the port of Rousse on the Danube, linking the Ottoman capital Istanbul with Central Europe. - The town was finally liberated on 27 July 1878 after the Russo-Turkish war of 1877-1878 and it grew rapidly. Varna has a great location and is has mild climate throughout the year. The coldest time during the year is usually from December to Mart, in which the average temperature is between 5 and 10°C. The summer begins in early May and lasts till early October. Temperatures in summer usually vary between 25 C and 35 degrees C. The hottest months are usually July and August, with temperature around 30 - 35°C, so it’s the perfect climate to go to the beach and enjoy the sun. Seawater temperature during the summer months is usually around 23–27 degrees C.
Varna is accessible by air (Varna International Airport), sea (Port of Varna Cruise Terminal), railway (Central railway station), and road. ​Major roads include European roads Varna-Bucharest E70, Varna-Istanbul E87 and Varna-Constanta, Romania; national motorways Varna-Sofia A2 (Hemus motorway) and Varna-Burgas A5 (Cherno More motorway). There are bus routes to many Bulgarian and international cities from two bus terminals. There are also train, ferry and roll-on/roll-off services to Odessa, Ukraine, Port Kavkaz, Russia, Poti and Batumi, Georgia. The public transport system is managed by "City Transport Varna" and has been recently modernised. Ticket prices are reasonable: from 1lv (0.50€) for city zones to 3lv (1.50€) for routes Varna-Golden Sands. Along with local buses, trolleybuses, fixed-route minibus lines, there is also a large fleet of taxis. 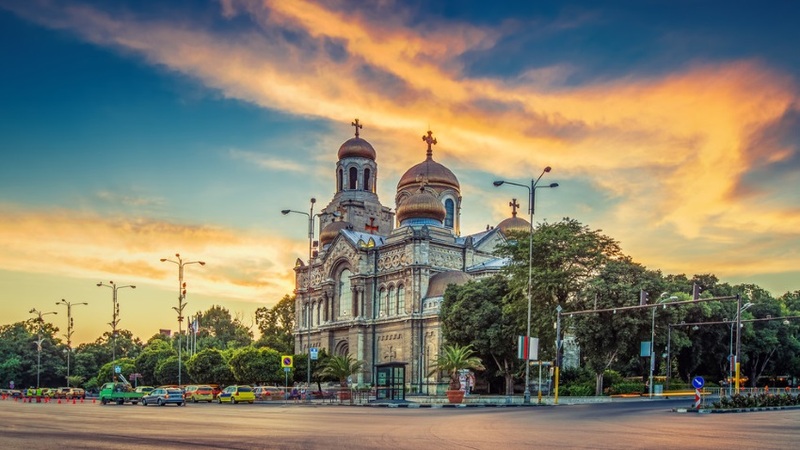 With its modern port, railway connection and international airport providing connection with 35 states and more than 100 world cities, Varna is one of the largest transport centers in Bulgaria. 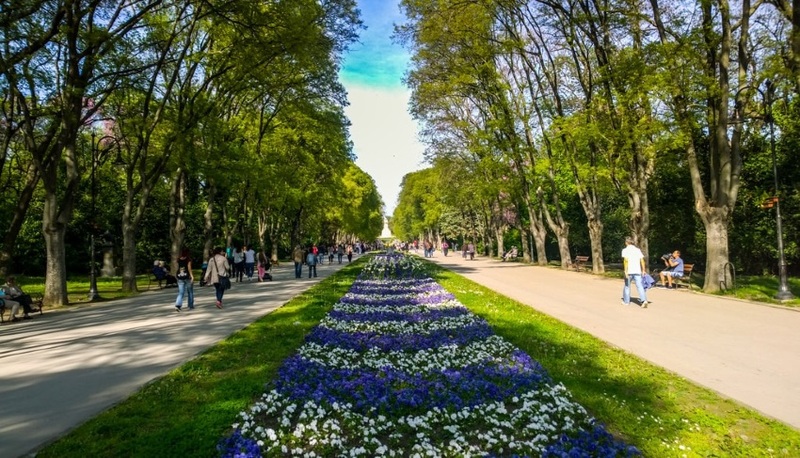 The Sea garden is Varna’s largest, oldest and best known public park, also said to be the “largest landscaped park in the Balkans”. Located on 850 decares along the seaside line, the Sea garden is an important tourist attraction and a national monument of landscape architecture. There is a sun-dial representing a flying swan at the entrance. It’s the favourite place for recreation and fun of the citizens of Varna, old and younger. Apart from the long alleys for promenades, the sea coast with the beach and numerous nice restaurants, bars and clubs, one could also enjoy a swimming pool complex with an amazing view on the sea, and lot of children’s playing grounds. For sure, mainly when it’s sunny, it’s a real pleasure to stroll in the park, to play sports(there are tennis courts,football fields,swimming pool), to walk, to run, meditate, bike ride or just draw on the ground.There is a children's complex with a lot of amusements: water wheels, slide, archery, trampoline. Just before the main alley of the Sea garden is situated the called “Bridge of Wishes”, a small bridge which is believed to fulfil wishes if you cross it walking backwards and with your eyes closed. There are also a lot of things to visit: Dolphinarium,Aquarium,Natural Science museum,the Naval museum, the Copernicus astronomy complex planetarium,the Zoo,the Terrarium and much more. Along the alley, which runs parallel to the coastline, there are a number of small cafes and restaurants, offering seafood specialties as well as attractive discos. The sea garden is the jewel in Varna’s crown. The strategic position of Varna on the map of south-eastern Europe has turned the city into one of the largest settlements on the Black Sea shore since antiquity. Multiple monuments presented today in the city Archaeological Museum date back to this period. The museum’s impressive collection includes the finds from the Varna chalcolythic necropolis – the oldest golden treasure in the world found by now, dating back to six thousand years ago. Among the rest of the museums, some of the most interesting ones are the Maritime Museum and the Ethnographic Museum. The Maritime Museum collection includes articles related to the Bulgarian military and commercial shipping. 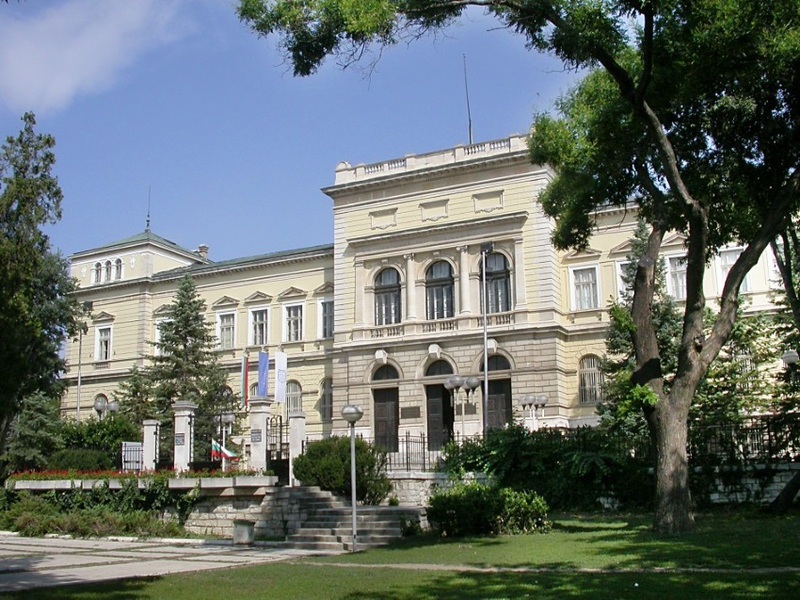 The Ethnographic Museum presents the rich diversity of culture and the style of life of the population in Varna region from the second half of the 19th and the beginning of the 20th century. As a cultural center, Varna has built one of the largest and richest fine arts galleries in Bulgaria. An exposition of icons painted in the Age of Revival, are kept in the church St. Atanasius, built in the 18th century, and one of the most interesting historical landmarks of the town – the Roman Baths – the largest Roman bath on the Balkan Peninsula with an area of 7000 square meters, is situated in close proximity to it. It is the forth in size in Europe, after the baths of Karakala and Diocletian in Rome and in Trevira (Trier, Germany). It was used until the end of the 3rd century. The shining copper domes of this majestic church form one of the city’s postcard scenes. The cathedral was built not long after the Bulgarian Liberation from the Ottomans by the Russians in the late-19th century, and was modelled on the temple at Peterhof Palace in St. Petersburg. More than 50 of the icons that you can see in the church’s cavernous interior were donated by the Russian Tsar Nicholas II in the early 20th century, and much of the other decoration that you can see inside was added in stages because of war. For instance, the huge stained-glass windows weren’t installed until the 1960s. 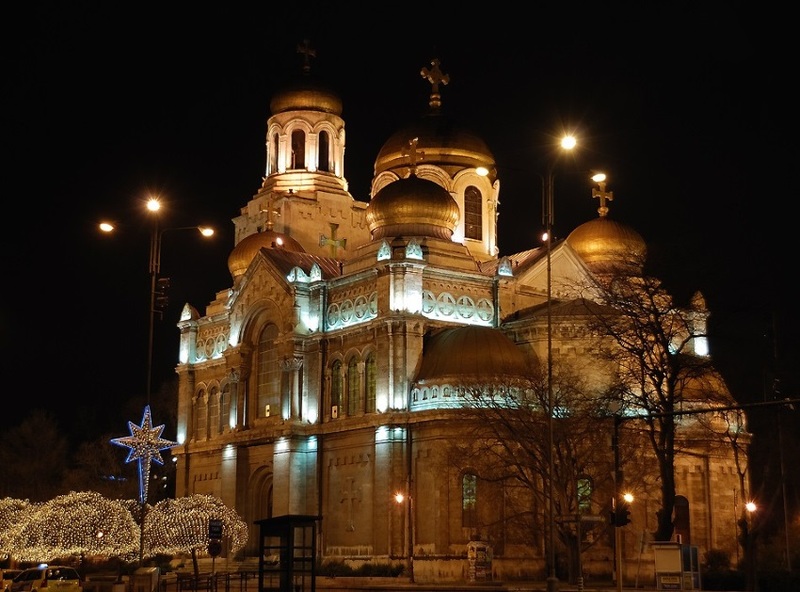 To this day the Cathedral is one of the most beautiful places in Varna. 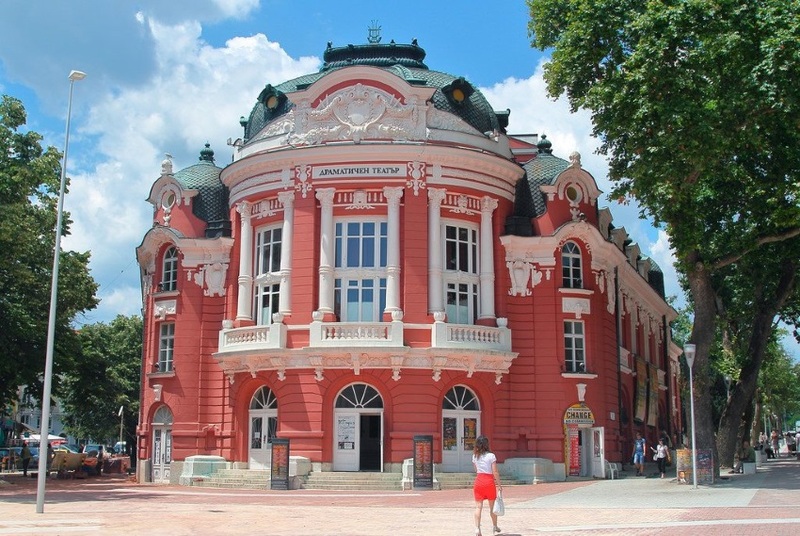 In the beautiful building of the drama theatre „Stoyan Bachvarov“ can be found the theatre, the opera and the Varna philharmonic. It was designed in Viennese fashion. On March 12, 1921 the theater opened its first season with the modern play „The instinct“ by Anry Kestmeker. 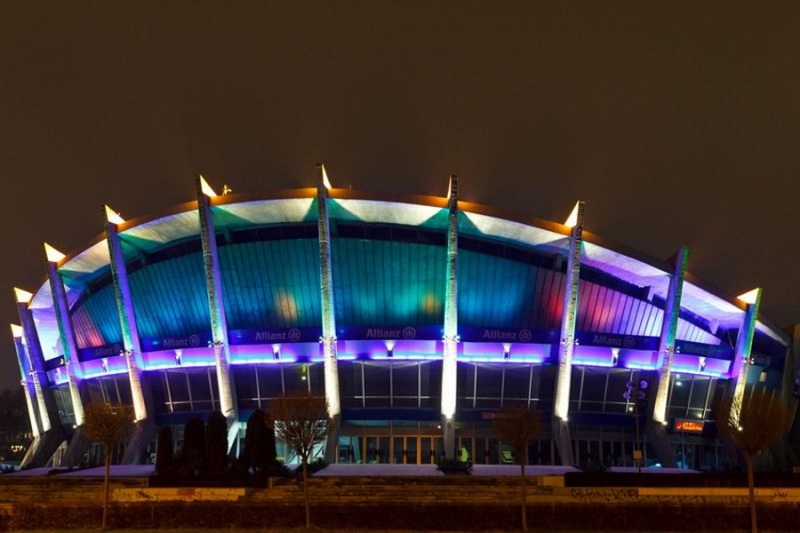 Palace of culture and sports is a multifunctional complex, positioned at a central location in the sea capital of Bulgaria. It is one of the main symbols of the city and throughout the years it has proven itself to be a common place for cultural and sports events, conferences, expositions and exhibitions. 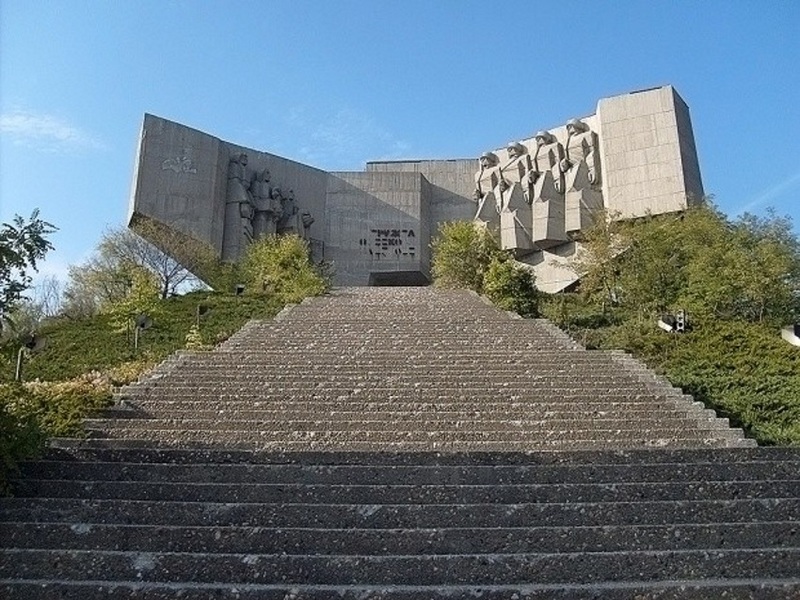 The monument was erected in honor of the Soviet Army on Turna hill at 110 meters height above sea level in the northwest part of the town of Varna. Before the construction of that imposing monument symbolizing friendship between the two peoples, on that place there had been a common grave of the fighters against fascism and capitalism. The idea of the monument dates back to 1958. 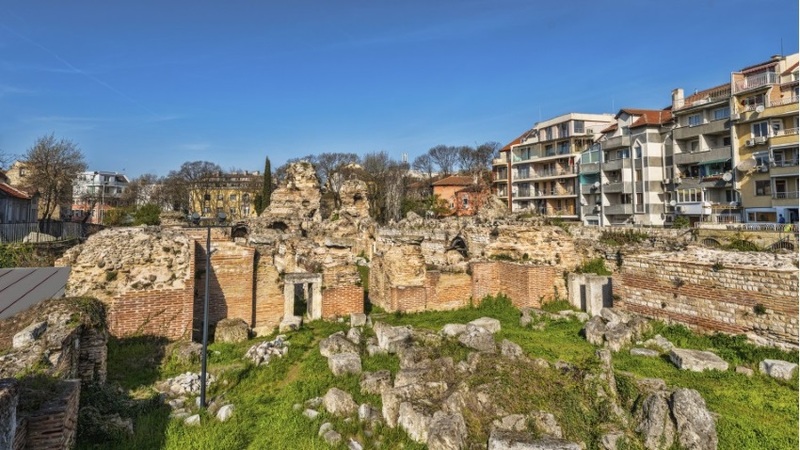 At the end of the 2nd c. A.D. thermal baths were built on a territory of 7.000 sq. m.
These were the biggest on the Balkan Peninsula. They became the centre of the public life in the town. Roman Thermal Baths are the largest ancient building discovered in Bulgaria so far. The well – preserved walls outline an imposing building. The plan of the building is almost symmetrical. The part uncovered includes all the principal premises of the baths. Visitors entered it through two entrances on the northern facade. Wide stairs led to the antechamber, the purpose of which was to guard the dressing rooms from cold air. The premises were faced with marble slabs. Multicolored mosaics had been used for the decoration of the marble walls. The richness of the ornamentation make these thermae a remarkable monument of ancient architecture in the Bulgarian lands. Just beyond Varna’s northeastern suburbs is an astounding Orthodox cave monastery complex that is part of a protected natural area just in from the coast. These caves are man-made and have been purposely carved from the face of a 25-metre-high karst cliff. It’s one for the sure-footed, as some of the terrain can be tough! Inside the monastery you can see boasting mosaics that have survived very well, and medieval frescoes that have been partly lost. From there you can walk the short trail through the forest to get to two catacombs. More helpful information about Varna, such as: Cost of living, Insurance, Medical facilities etc.